At the front door there is plenty of room to leave skis and outdoor equipment. 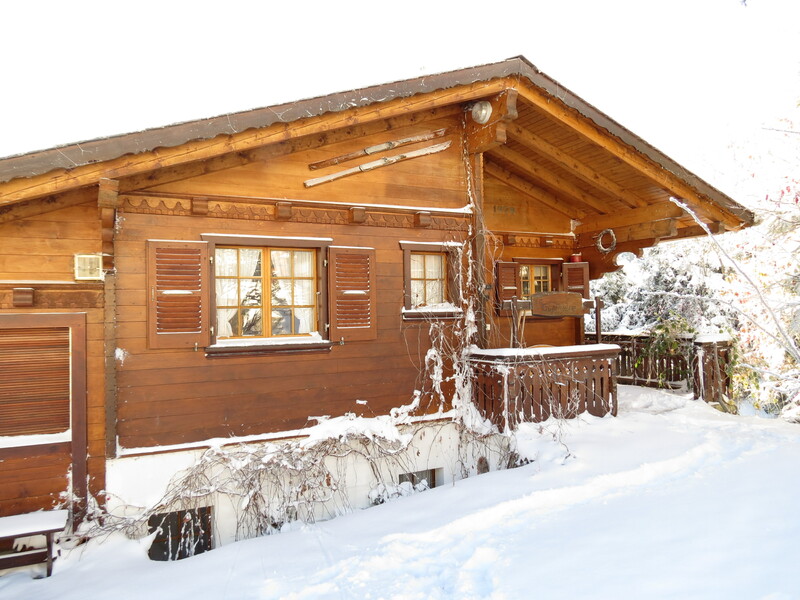 Just inside the front door, in the hallway on the upper floor, is space to hang coats and jackets.The chalet has two storeys and, as is usual for chalets, the bedrooms are on the lower floor and the living area on the upper floor. Due to the chalet being built on a hill-side the entrance is on the upper floor. However, the chalet entrance is level to the road and driveway. There are no steps from the parking area to the front door, (unlike nearly every other property in the village). The open-plan sitting and dining area leads through large French doors onto the balcony, which wraps around three sides of the chalet and is predominately south-facing. Sunlight floods in throughout the day, particularly in the morning. A small wooden table and chairs make this a perfect spot to enjoy a coffee or alfresco meal. 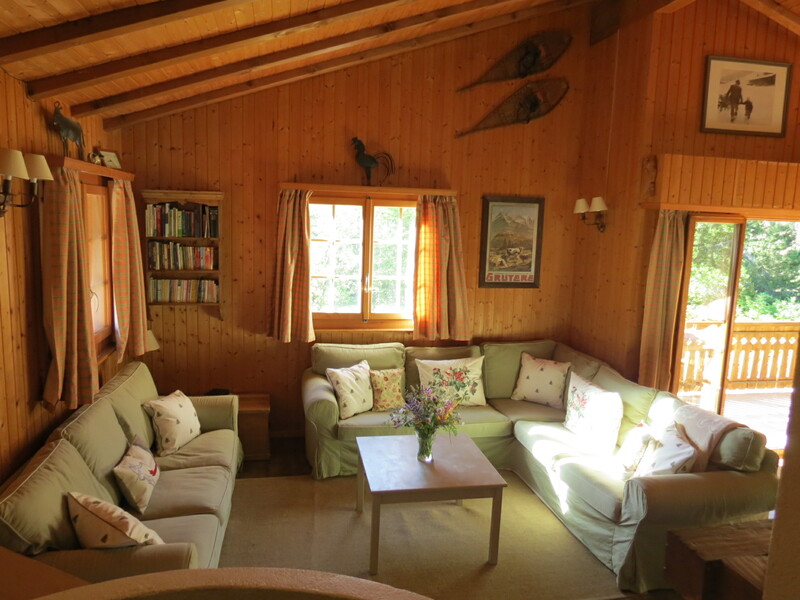 The living area has two generous, comfortable sofas around the log fire. The coffee table is ideal for playing cards or one of the numerous board games available – there is an antique trunk full of games and puzzles. There’s an iPod/MP3 player, digital radio and plenty of books and magazines for your entertainment. There is also good wi-fi internet connection. The small, but well-equipped kitchen also has patio doors to the balcony and a serving ‘hatch’ to the dining area. The kitchen is fitted with a dishwasher, full-height integrated fridge freezer, built-in oven and hob and is fully equipped with everything you will need for a self-catering holiday, including a kettle, toaster, microwave, food processor and fondue set. The extendable dining table comfortably seats 10 people with a combination of chairs and benches. 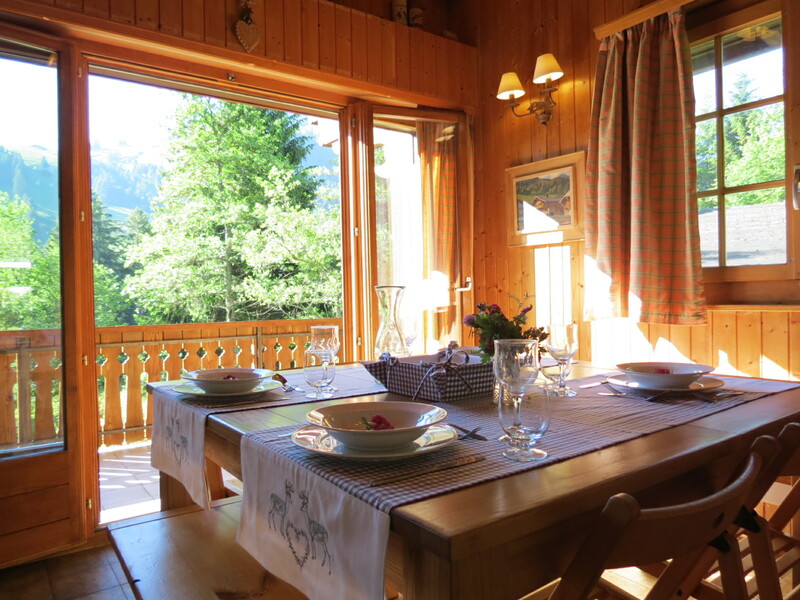 It is located between the kitchen and the balcony and is a lovely place to enjoy a meal with the views of the mountains. For more photos please see the Gallery page.